The E-cig Summit went very well: fast and furious as usual, but with an excellent range of speakers. The main differences with previous summits were, lots more Americans and for the first time an industry speaker – Fraser Cropper – who for my money gave one of the best speeches of the day. Other highlights for me were Attorney General for Iowa, Tom Miller, who was a joy to meet, Ram Moorthy, because he appeared to be trying to distance himself from the BMA’s position and especially that of BMA Wales’ Phil ‘thalidomide’ Banfield, Konstantinos Farsalinos doing his usual thing of driving Conference Chair Ann McNeil mad by overrunning and making additional ‘speechlets’ and Martin Dockrell paying tribute to vapers for helping to get the UK as far as it currently is. The presentations and discussions at The E-Cigarette Summit this year demonstrated how far the debate has come and provided opportunities to look forward. I was able to make a direct request to the representative of the BMA to reverse their policy which called on the government to extend the smokefree legislation to include all use of e-cigarettes – which the government sensibly ignored. However this ill-informed position is frequently cited as the reason why vapers are being told by their employers to go and stand in the smoking shelter alongside the tobacco users. An indication was given to the Summit that the BMA policy was likely to be challenged early in 2017. I also made a proposal to Fraser Cropper, Chair of the Independent British Vaping Trade Association (IBVTA), to produce an industry code of practice which could be adopted by responsible retailers as an assurance to customers and regulators that: they are only selling legally compliant products; complying with the restrictions on sales to under 18s; and giving advice on safe use, storage and charging. I also suggested that they could establish links to their local primary care services for customers who had health problems or also wanted to access stop smoking support. My proposal received a round of applause, but I do not know if it will be taken up. In my view it is certainly needed. GPs and other health advisors complain that they are unsure what to advise patients and enquirers who want to know how to obtain and use e-cigarettes. What they want to be able to say is ‘Go to a reputable supplier to purchase a reliable product and use according to the manufacturer’s instructions’. Who better to send them to than a retailer known to be complying with an industry code of practice and promoted as such? The fourth e-cigarette summit took place at the Royal Society of London. The event did not disappoint, it ran smoothly despite a very tight schedule, and all presentations were of high quality and insightful. 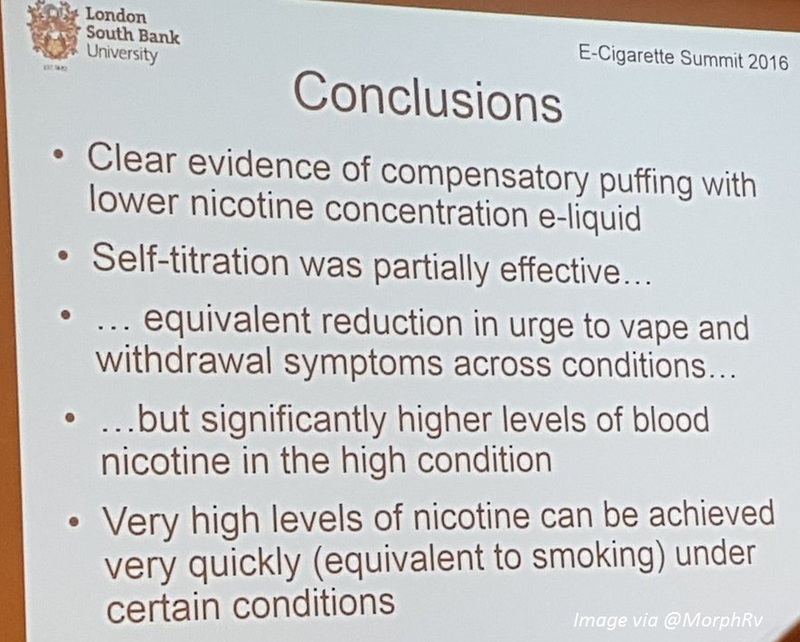 For me, the first highlight was Professor Peter Hajek’s presentation on drawing attention on the damaging consequences of misreporting of studies and misinformation on the harms associated with e-cigarette use, which act as the main driver of a growing misconception from smokers that e-cigarettes are as harmful or even more harmful than tobacco cigarettes. This was later echoed by Professor Marcus Munafo who stated that the presence of potential harmful compounds or indeed any chemical, does not constitute tangible harms, it is the dosage which makes the poison. My second highlight should be the presentation by my colleague Dr Lynne Dawkins who presented our study findings on nicotine titration by vapers. These findings, available here, were published at the time the EU-TPD, which imposes a cap on nicotine above 20 mg/mL, came into force. Part of this work was to explore, if and to what extent vapers adapt their puffing behaviours according to the nicotine strengths they are given. We found that vapers responded to the lower nicotine strength by significantly increasing their puffing patterns and consuming more liquids. Our findings suggest that these regulations will have a negative effect on users who need higher nicotine concentrations to achieve smoking abstinence and avoid relapse. This simply confirmed what the vaping community experience and has been arguing for since the formulation of the EU-TPD has come to light. On that note, I would like to applaud Professor Linda Bauld in recognising the huge contribution made by vapers in this research area and encourage more vapers to get involved. In contrast, Professor Neal Benowitz held a presentation on the harmful effects of nicotine on young brains and on people with underlying conditions, all in the context of a ‘nicotine reduction strategy’. My views are that whilst some studies found an association with the use of nicotine and behavioural problems in adolescents, we should remain cautious and not overstate these risks. Nicotine itself when administered in forms other than smoking, performs poorly. We need to move away from demonising nicotine when discussing its effects as a psychoactive drugs. The last presentation added some joviality when Iowa Attorney General Tom Miller praised England for their position to embrace e-cigarettes as a potential means to address the challenge of health inequalities and harms caused by smoking, and urge experts from the UK to come to the US and help change the focus from abstinence to harm reduction. Finally, I would like to praise Professor Ann McNeill for brilliantly chairing this summit and to Amanda Strange for her magnificent timekeeping management. I certainly look forward to next year’s summit. When I first became involved with vaping, roughly four years ago, two things were certain: the BMA would never attend an event like the E-cigarette Summit and if they had done their position on vaping would have been well received by many in the room. 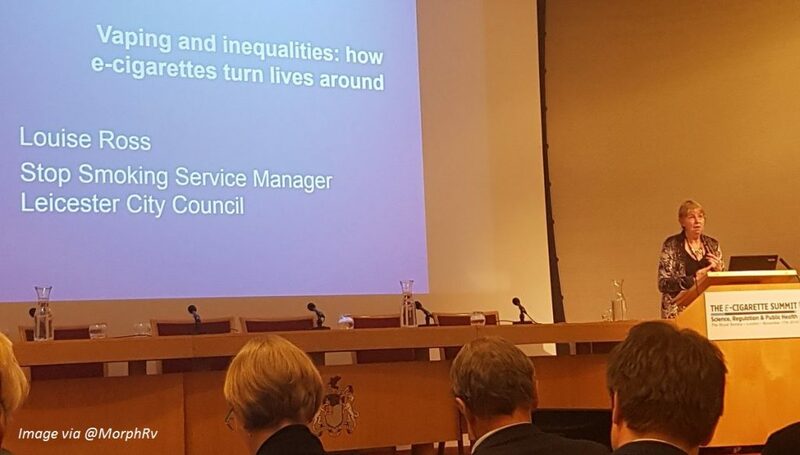 Last Thursday, the fourth E-cigarette Summit took place at The Royal Society and the BMA were present. This is a significant achievement and in a further demonstration of how much progress has been made over the last four years, it was encouraging to see significant people challenging the BMA to change their position on vaping. 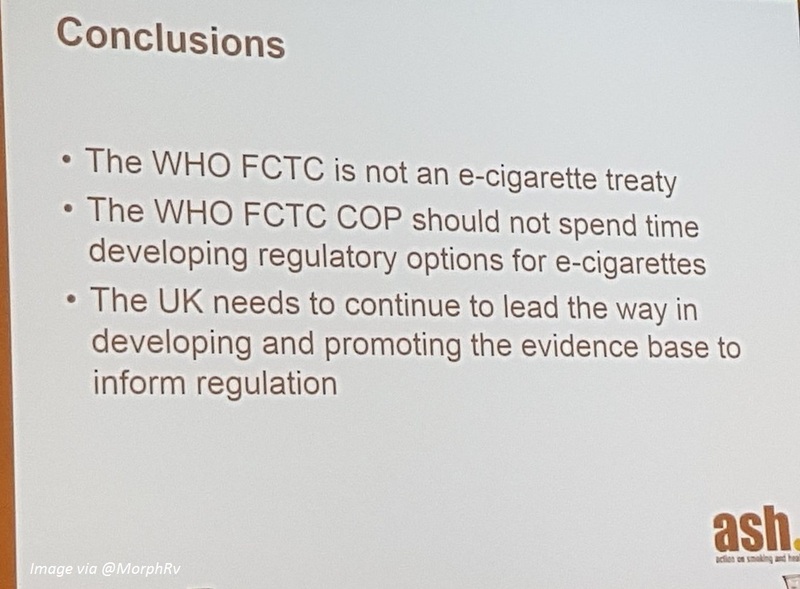 For me, this year’s Summit was a clear sign of the progress that has been made and how there is now a willingness to move forward on new issues and to ask questions that four years ago would have been unthinkable: could we remove vaping from the WHO FCTC? Can we have an open discussion about nicotine? What will the post-Brexit regulatory environment look like? At this year’s Summit the independent vape industry was allowed a platform. This is yet another sign of the progress that has been made. Fraser Cropper, Chairman of the Independent British Vape Trade Association gave a very well received speech on the vital importance of the independent vape industry. So, this is a challenging time for all those involved in vaping as we cope with the challenges of new regulations and the future threat of taxation. It is however an exciting time, and as last week’s E-cigarette Summit demonstrated that is much to be positive about. Amanda Strange; vapers up and down the UK; forward thinking and open minded public health leaders, and the responsible independent vape industry can all take some pride in the role they have all played in moving the debate forward and placing the UK as one of the most vape friendly countries in the world. There is still much to be done, but as the Summit demonstrated, we have come so far and the future looks bright, in the UK at least! I really look forward to the annual event that is the Ecig Summit, because it always serves to strengthen my determination to be bold, creative and innovative when planning new ways of including vaping in the care pathway for Leicester smokers. This year in my own presentation, I tried to convey the importance of remembering people from disadvantaged communities, where mobile internet use is less common, and where people have to queue at libraries to use the internet. This lack of access makes it so much harder for would-be ex-smokers to check out YouTube for information on vaping, or to search for answers to their questions on a forum. Stop Smoking Services can help bridge that gap. However, this year’s Summit made me think about wider horizons, and it was clear from the Iowa Attorney General’s keynote speech that the UK has so much to teach the USA. Tom Miller was effusive and gracious in his praise: when respected organisations all say that vaping is substantially safer than smoking, the world must listen, and stop making policies and laws that undermine ordinary people’s confidence and push them back to smoking. This was reinforced by Prof David Abrams, when he told me that politicians in the US are also strongly convinced by personal stories; he reminded me of the value of consistently gathering all those testimonies we get from Stop service users who had tried many times before to stop smoking, but who found that switching to e-cigarettes made them…well…happy. Makes me happy too! Phew! I’ve been asked to give a short summary of the e-cig summit. But seeing as I struggled to give a satisfactory round-up in 4,500 words that’s going to be a challenge! So I am going to pick up on what, to me, was one of the most important themes. We’ve had speculation that nicotine might be bad for us in some ways. It may not cause cancer, said Neal Benowitz , but it could be bad for us in other ways. However, you would have to ignore almost all empirical evidence from the Snus experiment in Sweden for this to be valid. But testing genes in labs and speculating about the potential dangers of nicotine can only go so far. What happens when scientists study vaping in the real world? This is precisely the insight Professor Polosa provided us with. In the two areas he studied, he found that vaping didn’t just reduce harm, it actually reversed it. In a group of patients with high blood pressure he found that switching to vaping was just as effective as taking a medicine designed to treat hypertension. Professor Polosa also found that when asthmatic smokers switched to vaping, they showed an improvement both in symptoms and in life quality. The longer they vaped, the more the benefit, with the improvement carrying all the way into third year of follow ups. And despite all the debates about regulation, politics, communication and industry, the reality that vaping can not just reduce harm but reverse it was the most important, and incredibly positive, take away for me. The highlight of the summit for me was the recognition afforded to the UK from attorney general for iowa Tom Miller. His understanding of where the UK has gotten things right and hope that USA can somehow get it right following our example came across as being both genuine and sincere. Louise Ross & Linda Bauld came across as their usual passionate and compassionate selves in their presentations. A low point for me was Deborah Arnott’s attempt at a cover up story for why the COP7 denied access to both the press and public. Her referral to “twitter bollox” left me feeling angry and bemused. Furthermore, her recognition that nicotine might not actually be the real problem was negated by her refusal to admit that the TPD was a bad thing – she does not appear to understand that her own figure of 200k+ (9% of current UK vapers) will be directly put at risk by the limit on nicotine strength alone. There are many more encouraging aspects to come out of this valuable yearly summit, but it would take a long time to list them all here. Final mentions go to Anne McNeil for expertly chairing such a busy conference and Amanda Strange and her team for putting together such a varied and balanced set of speakers. All in all, a terrific event as always. Blogger at Facts do Matter. The E-Cigarette Summit can be, and often is, jam packed with quick-fire talks given by academics, consultancy professionals, doctors, professors, and other specialists – most notably within Stop Smoking Services – to discuss, or specifically to present, the current science, policy and overall evidence on e-cigarettes. Now into its fourth year, the schedule this time had a focus on communication of the evidence to the public, and specifically to smokers. Given that, over the course of the last twelve months, there has been (and continues to be) significant misrepresentation of “risks” and seemingly poor coverage of “good” results. Overall, there is still much ground to cover – the regular conflation of smoking & vaping is a prime example – and it seems the main responses to that are to produce heavyweight reports instead of issuing regular statements to counter the worst headlines. My main feelings on the Summit now (having attended 2015 & 2016), is that there is a key element missing – dissent. It is nice to present the evidence, but there is a distinct echo-chamber feel now, considering there are a lot of public health representatives “on-side” within the UK. 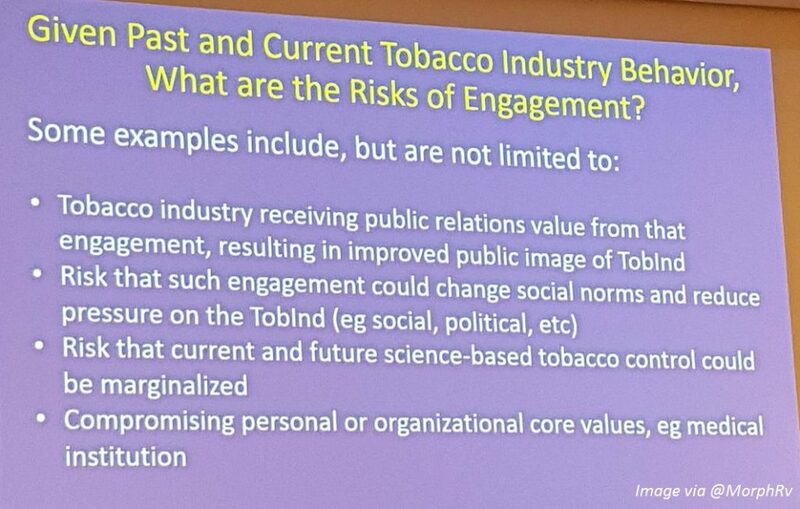 More debate is still needed, both within public health & tobacco control (nationally as well as internationally), but also within the legislators & policy makers. 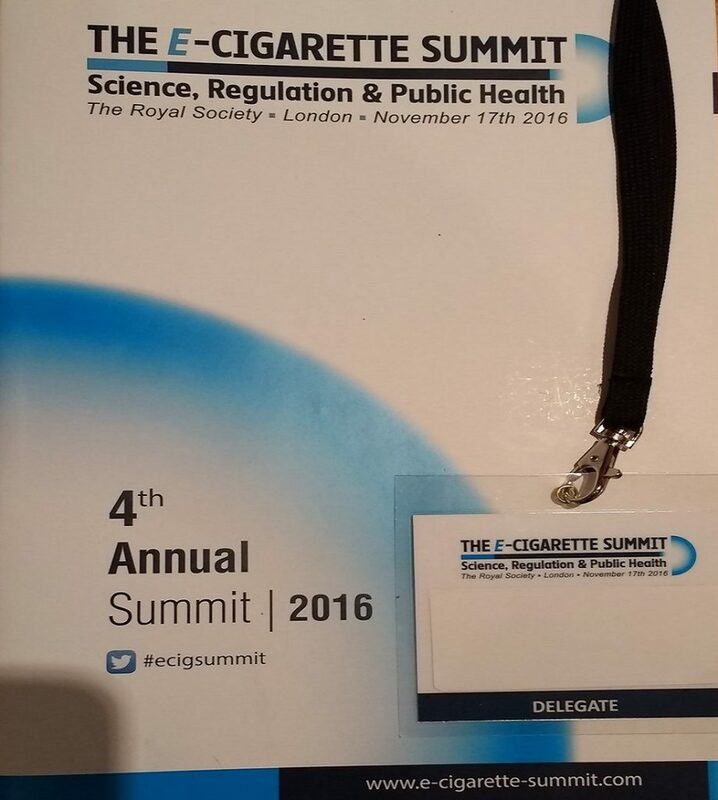 I’ve just attended my third consecutive E-cig Summit which I have to say was the most enjoyable and insightful to date. It was clear for all to see that the BMA clearly create policy and commentary based on nothing more than an ideology and a stubborn inflexibility that I find staggering but not surprising. The use of nicotine and its effects on the human body was a dominant feature and I learned a lot from the well balanced presentations. I’ve no doubt there will be a lot more information available over the coming years. Studies and the consequences of poor science was also a vital inclusion this year. I was heartened to learn of fresh ideas and the willingness to seriously embrace the notion of credibility within a complex field. Filtering and deciphering; well, the devil is always in the detail and we must ensure misinformation is challenged vigorously whilst credible and newly presented views are taken onboard once verified as fact. This was made very clear. Lastly, I was delighted to witness the presentation by Fraser Cropper, chairman of the IBVTA. The Independent Vaping Industry was for the first time, given a platform to express its views and thoughts and to explore the landscape for this vital and most significant sector. In this arena, a Tour de Force delivery was necessary. He did NOT disappoint! Others will have gone into more detail of the individual speaker’s presentations, so rather than repeating that I’d like to share an overview of the event and a few things at this year’s event which surprised me somewhat. To be continued…. 1 Pings/Trackbacks for "Eyewitness: E-Cigarette Summit ’16"